The restoration and the streetscape additions were given the 2002 National Preservation Award by the National Trust for Historic Preservation. The building at 442 King Street has experienced an eventful existence. Built before 1840 as a residence, the building was soon converted into a bakery. The building’s front facade was severely damaged in the earthquake of 1886. At the time, a three story pressed metal Victorian facade was attached on King Street. The building fell into disrepair and faced demolition permits in the 1970’s and again in the 1990’s. 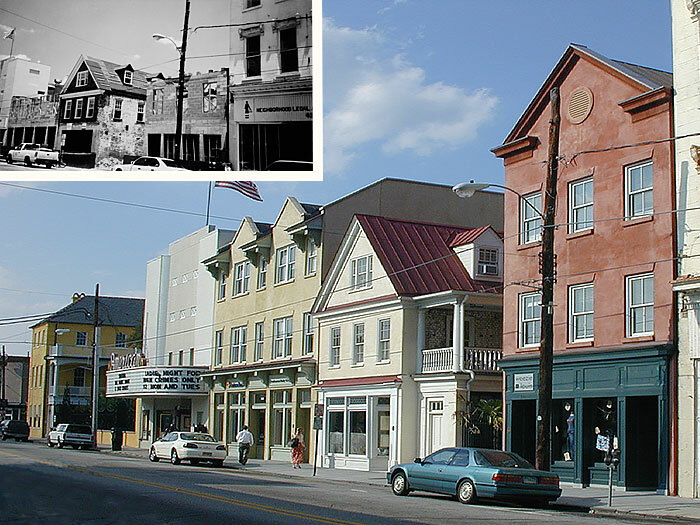 The building’s Victorian facade was lost during Hurricane Hugo in 1989. Vacant and dilapidated, the building found new life in the year 2000 as the restaurant FISH. The lots flanking the building at 440 and 444 King had been vacant for many years. Used as surface parking, the lots created a “missing tooth” appearance along the streetscape of Upper King Street’s historic district. The new structures constructed on the vacant lots were designed to complement the mid to late 19th century buildings along King Street. The new building designs are compatible in height, scale and mass while incorporating features common to many historic King Street structures.